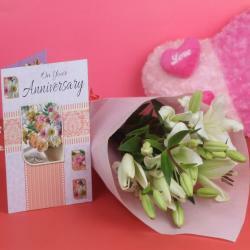 Product Consist : Hand Tied Bouquet of 10 Red and white Roses, 1/2 kg Eggless Butterscotch Cake (Mgs on cake : I Love You ) along with Anniversary Greeting Card. If there is one thing that conveys feelings of heart effectively, then it is red and white roses. And, if you add some other amazing goodies to mix roses like cake and card, then you are sure to win the heart of your love interest. 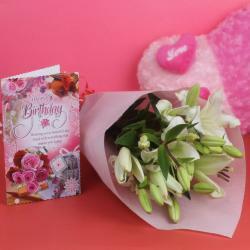 Hence, gift experts of Giftacrossindia.com have handpicked and put together this ultimate hamper of a 10 red and white roses, delicious eggless butterscotch cake and anniversary greeting card. 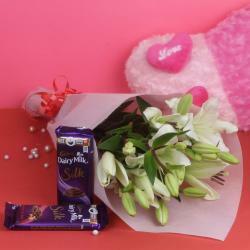 Send this exceptional hamper online to your special one from Giftacrossindia.com and reach out to her with pure love. 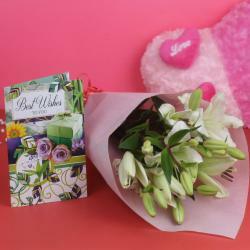 Product Consist: Hand Tied Bouquet of 10 Red and white Roses, 1/2 kg Eggless Butterscotch Cake along with Anniversary Greeting Card.